With all the negative events of this past year, something wonderful actually happened, and it happened right here in Cannon County. The week before Thanksgiving, this director, Lisa Baird, discovered that the former Angel Tree Director, Cindy Haley, had retired from this position and there was no one stepping up to take her place. This meant a lot of children in Cannon County would not have Christmas. I took the issue before the SAVE Board and unanimously it was voted that SAVE would spear head this years Angel Tree. With not much time, we begin work. However, we were amazed at the outpouring of support we received from individuals, churches, business, and county individuals that stepped up to help. Several businesses provided the public a place to pick up their angels and a drop off for presents (AI Quick Cash, Dollar Market, Osborne/Piggly Wiggly, First Bank, Regions Bank and First National) while others collected toys (Mapco Express, Cash Express, Dollar Market and Cannon County Sheriff's Department). Churches took groups of angels for their congregations to sponsor (Simmons Chapel, Cornerstone and Woodbury United Methodist). First United Methodist even provided a room for storage and their fellowship hall for wrapping and distributing the gifts. Crane Interior sponsored two families and three individual angels. 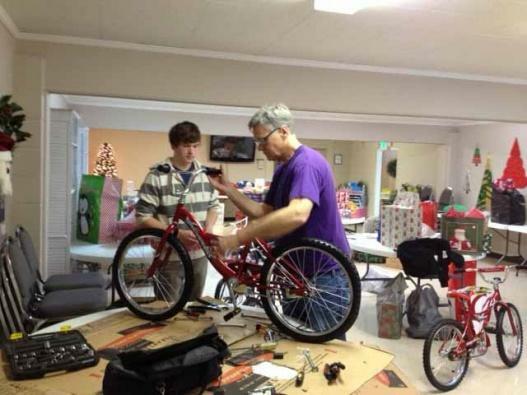 Volunteers helped wrap, shop and put together bikes. Board Members even got in on the fun, shopping, wrapping , greeting people, finding sponsors, etc. All the hard work paid off. We were able to provide Christmas for 164 children in Cannon County. It felt great to be part of this project and made me proud to be from a county were so many people care about our community. Special Thank Yous go out to the following: Woodbury First United Methodist Church, Simmons Chapel Free, Methodist Church, Cannon County Sheriff's Department, Cornerstone Church, Corey Davenport, Crane Interiors, Tony and Tracy Neal, Chris Anderson, Penny Daniels, Regions Bank, Mryna Blair, First Bank, David and Cindy Young, First National Bank, Clay Young, Mimi Franklin, Conner Young, Sandra Hill, Cash Express, Mapco, A1 Quick Cash, Dollar Market, Brother John Hembree, Osbornes Piggly Wiggly, unanimous donors, and all the individuals who sponsored Angels. SAVE will spear head the Angel Tree next year. If you would like to be involved you can contact the SAVE office at 615-563-6690.